Figure 2. Map showing the bathymetry of the Gulf of Maine and regional physiographic features. Characterizations of bottom shear stress and sea floor mobility in this database extend offshore to approximately the 120-m isobath. The Gulf of Maine region is the semi-enclosed basin separated from the Atlantic Ocean to the south by George's Bank, and extends from Cape Cod to Nova Scotia. (fig. 2). Spatially and temporally resolved estimates of bottom shear stress are calculated for seasonal and annual time periods. Seasons are defined as Winter (December-February), Spring (March-May), Summer (June-August), and Fall (September-November). Spatial Resolution: Approximately 3.5 km. Time Period: May 2010, to May 2011. 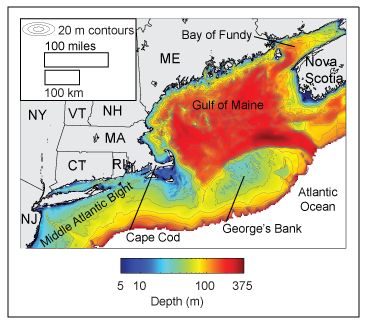 Currents: The Northeast Coastal Ocean Forecast System (NECOFS) for the Gulf of Maine, which uses the Finite Volume Community Ocean Model (FVCOM). The FVCOM domain includes the Gulf of Maine, George's Bank, and portions of the Middle Atlantic Bight. Developed at the University of Massachusetts at Dartmouth (http://fvcom.smast.umassd.edu/research_projects/NECOFS/). Contact: Model run by Dr. Changsheng Chen, Marine Ecosystem Dynamics Modeling Lab (http://omgrhe.meas.ncsu.edu/Group/). Waves: Simulating WAves Nearshore (SWAN) model applied to the western North Atlantic. Sediment Texture Data: USGS East-Coast Sediment Texture database (Poppe and others, 2005). Complete details on the procedure used to create the data files may be found in the associated metadata (links in Table 1). Table 1. Statistics of sea floor wave-current stress and sediment mobility in Arc polygon and point shapefile format for the Gulf of Maine from model output. Stress statistics are determined for the entire model grid, whereas mobility statistics are determined only at locations where sediment texture data are available. See metadata files for details of the calculations. Click on zip file to download.